The Green Series books are workbooks, or worksheet collections, each one oe a different mathematical topic (such as geometry, integers, statistics, or measuring — see a list below). The books contain one-page worksheets. Each worksheet is on one topic and has very variable problems that not only practice computation but also check for conceptual understanding, and include word problems. Each book in the Green series spans several grade levels on the same general topic, typically for grades 3-7. This makes it optimal for teachers who need worksheets on varying difficulty levels, and for parents/teachers who need comprehensive review material on a specific topic. The Green series books have been compiled from the grade-level collections (the Golden Series), so they contain duplicate content with them. The video below explains the basics of the Green Series books. The Green Series workbooks are available to purchase at this site, using the "Add to cart" buttons, and also at Currclick. Better Yet - Bundle Deals! Learn more about these Math Mammoth bundles! *BONUS*: Buy any bundle listed above, and get the fully upgraded Soft-Pak software for FREE (includes 4 math and 2 language arts programs, complete with on screen and printable options). Here at MathMammoth.com website — simply use the "Add to cart" buttons you see on the product pages. CurrClick.com carries all Blue, Golden, and Light Blue series books as downloads. They accept credit cards and Paypal. You will be able to download the products immediately upon the purchase, and also return to your account at CurrClick to redownload. Rainbow Resource carries printed copies for the Light Blue series books, plus several CDs (Light Blue and Blue series). Homeschool Buyers Co-op offers download versions of the Light Blue series, plus the Blue series bundle. Educents carries download versions of the Light Blue and Blue series. K5 Learning offers download versions of the Blue series. Lulu offers printed copies for the Blue, Golden, and Light Blue series books. By purchasing any of the books, permission IS granted for the teacher (or parent) to reproduce this material to be used with his/her students in a teaching situation; not for commercial resale. However, you are not permitted to share the material with another teacher. In other words, you are permitted to make copies for the students/children you are teaching, but not for other teachers' usage. 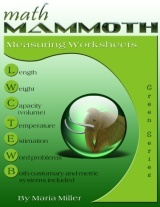 Math Mammoth books are PDF files. You will need Adobe Reader to view them, including if you use a Mac or Linux. You can try other PDF viewers, but they seem to either omit or mess up some of the images.